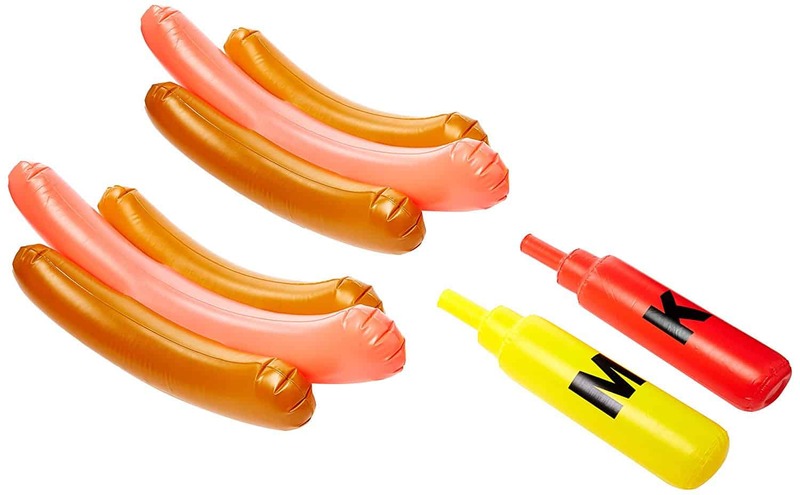 Want to give the kids a pool party they’ll never forget? 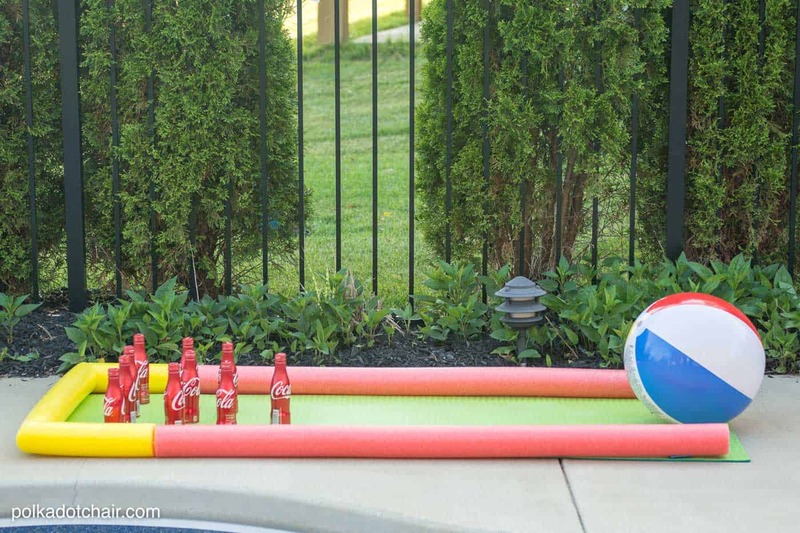 Today we’re sharing 15 totally fun ideas for pool party games for kids. Summer is full-on here and we’ve been making lots of trips to the pool to cool off. Over the years we’ve had a few pool parties for the kids and they’re always a blast. One of the best things about having a pool party is that you don’t really have to worry that much about entertaining everyone because the pool IS the entertainment. Seriously, kids can spend hours in the water and never be ready to come out. But, if you’re having a group over for some pool-side fun, then you may want a break from the usual Marco-Polo. 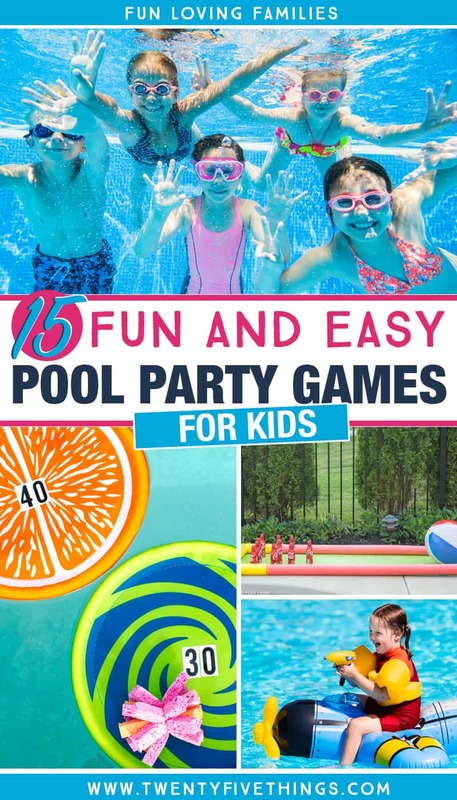 So, in an effort to help you kick things up a notch for your kids’ pool party, here are some really fun games that everyone will love. Just a quick note before we get started: For a lot of the pool games here, you can spend as much or as little as you want. I personally love the novelty of big, ridiculous floats, so I include many in this list. Pool noodles, on the other hand, are super cheap and are versatile enough to be used in the place of the big floats in many cases. So, get some ideas here and then adjust to your budget. *Please adjust the games to fit the swim levels of the kids participating. Weak swimmers should wear a life jacket and kids should always have adult supervision in the pool. Adult spotters are recommended for games that require balance to keep kids at a safe distance from the edge of the pool. All pool games carry some risk and safety measures should be followed at all times. These games are all meant to be played IN the pool. I know how nervous I get when there are a bunch of kids running around the deck of the pool (no matter how many times we tell them no running!) so the goal here is to keep the kids having fun inside the pool itself. 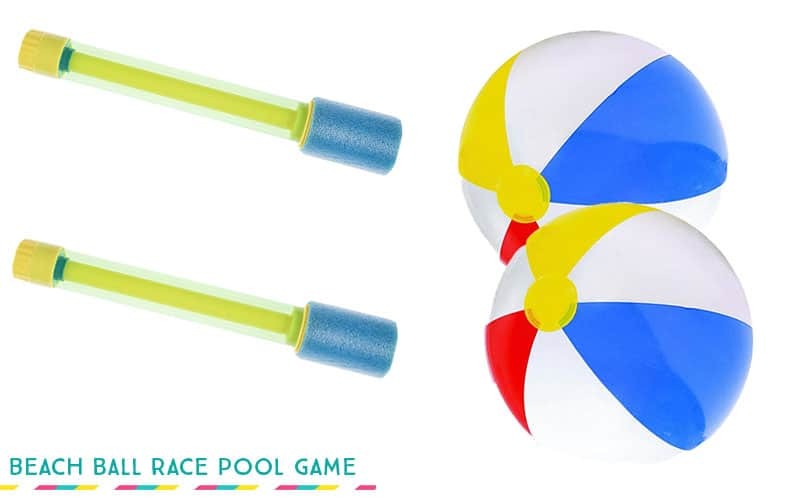 How to Play: Bring this classic kid’s game to the pool! How many rings can you toss onto the center cone? Each player has a turn to toss all of the rings and the player with the most points wins. The tubes can be used as pool floats when you’re not playing the game. 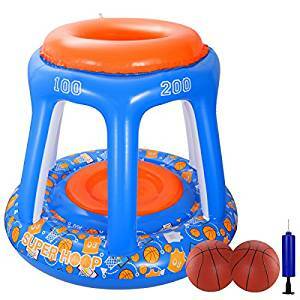 This game can be played in the pool or on the ground. How to Play: Use the vinyl numbers to set a score for each disc. Each player takes turns trying to throw the sponges onto the toy discs. Player with the highest score wins. 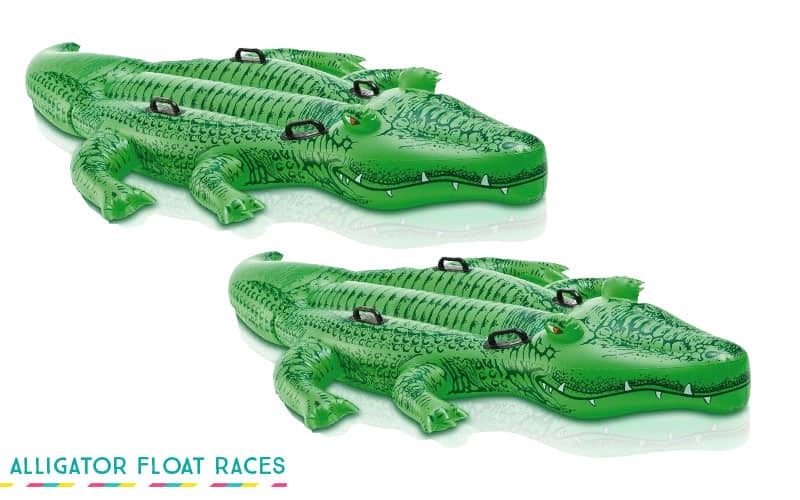 How to Play: Players must stay on their alligator floats as they race to see who can get to the other side of the pool the fastest. First player to the other side wins. How to play: One player from each team lays on raft facing towards center of pool. The other teammate stands/floats behind the player and holds on to the back of the raft. The player on the raft holds a basket. All of the balls are released in the center of the pool. When play starts, the teammate holding the raft lunges the raft towards the center of the pool so that the other person can try to collect balls in the basket. At the end of the match, the team with the most balls wins. An outside player should keep time and say when the round is over. 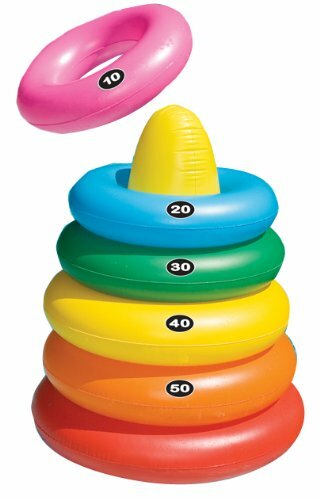 How to play: The object of the game is to move your beach ball to the other side of the pool using only your water squirter. Players are not allowed to use their hands to move the ball. The first player to reach the other side of the pool with the beach ball wins. Game can also be played as a relay race. How to play: Players must move the watermelon to the other side of the pool using only their heads. Greasing the watermelon beforehand makes the game more challenging. The person to reach the other side in the least amount of time wins. This game can also be played as a relay race, with teams moving the watermelon back and forth across the pool. How to play: Players compete to score the most points by throwing the ball into the “basket”. How to play: Each player must stay on/in their float while playing the game. Players can duck to try to avoid being sprayed by the other players. 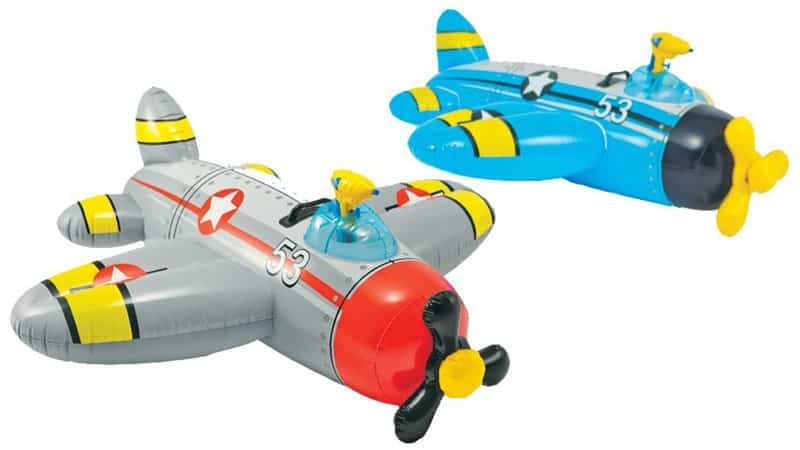 There are special floats, like the airplanes pictured above, that have a tube connecting from the water gun to the water in the pool to allow for continuous spray water guns. 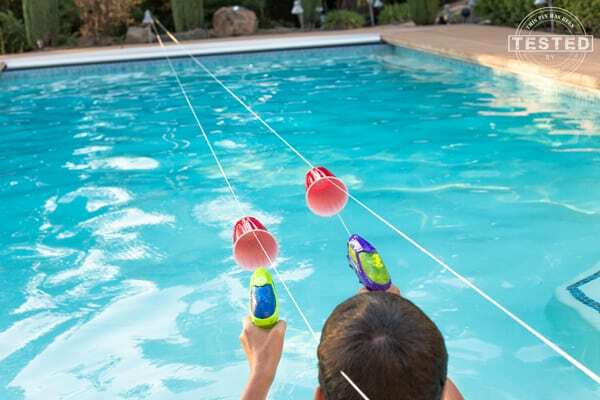 But, you don’t need a special pool float for squirt gun wars. Tube floats also work well for this game because players can spin and duck inside the tubes. How to play: Players try to knock each other off of their floats. The player who can stay on the float the longest wins. Dollar Tree version: Use pool noodles for riders to balance on, and another set of pool noodles for jousting. 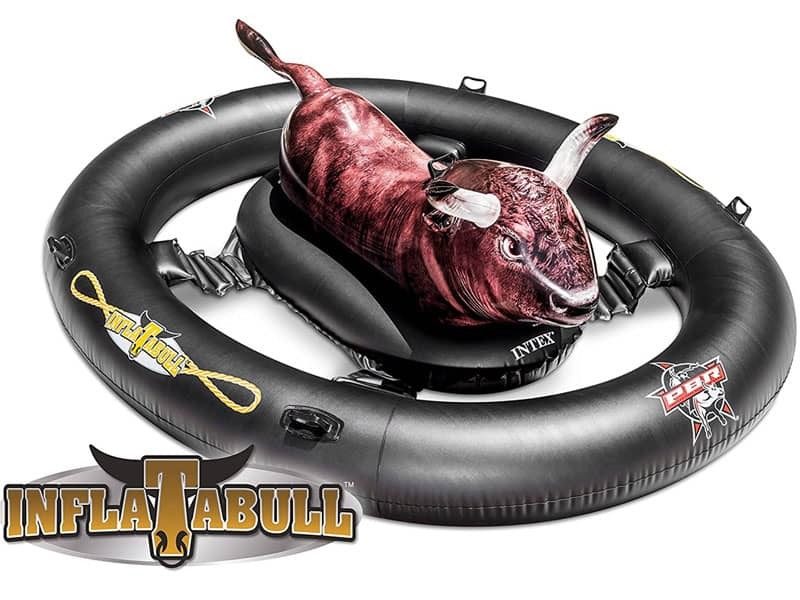 How to play: Players take turns trying to stay on the bull without falling off. An outside participant should keep the time. The player who can stay on the longest wins. How to play: To start the game, everyone playing has a chair. When the music starts, players leave their chairs and must swim around. Players may not touch the chairs while the music is playing and must continue to swim around the pool. An outside participant removes one chair from the pool. When the music stops, all players in the pool must quickly sit in one of the remaining chairs. Whoever doesn’t have a chair is out of the game. Play continues until only one chair is left. The winner of the last chair wins the game! 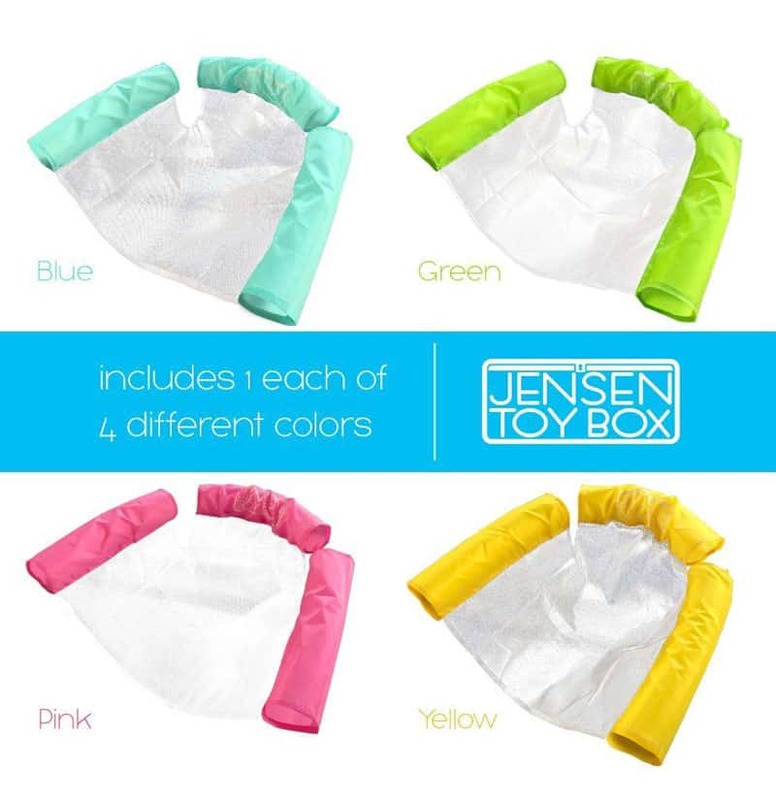 Dollar Tree version: Use pool noodles and mesh laundry bags to make your own DIY floating chairs (use this tutorial). 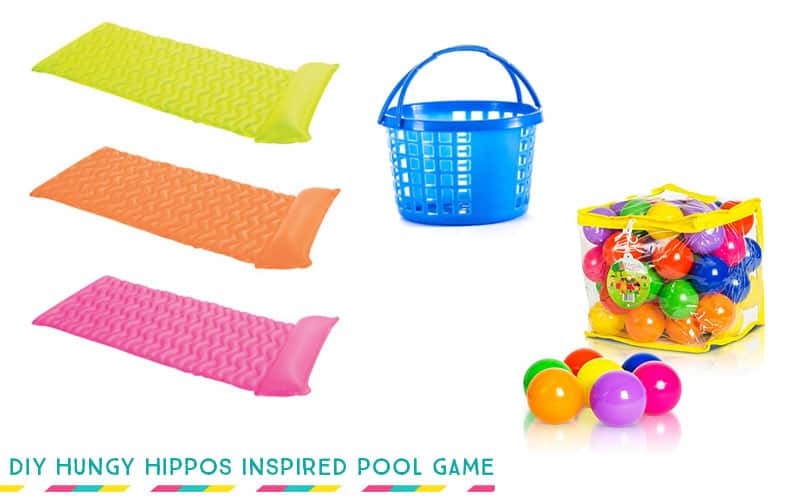 Here are some more fun games to play at your pool party. These are all games you can play outside of the pool itself, either on the deck or the backyard. Even though it’s a pool party doesn’t mean everyone will want to get in the pool. Here are some great options for friends who can’t swim or just need a break from swimming and splashing around. How to play: Separate players into even teams. Each team sits in a line, with each player facing the back of the player in from of them. Place a full bucket of water at the back of line of each team and an empty bucket at the front of the line. Mark a line near the top of the empty buckets with permanent marker or masking tape. 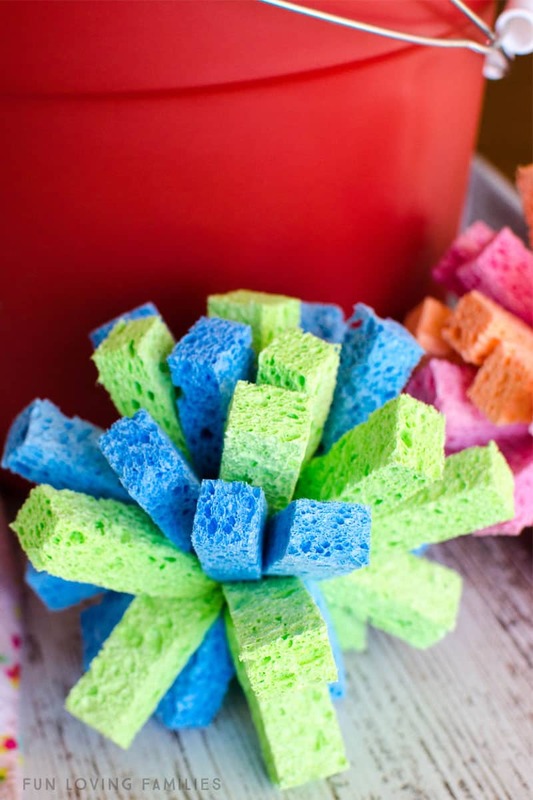 Teams will each have one sponge, which starts in the full bucket of water. Players must pass the sponge, over-head, from the back to the front of the line. 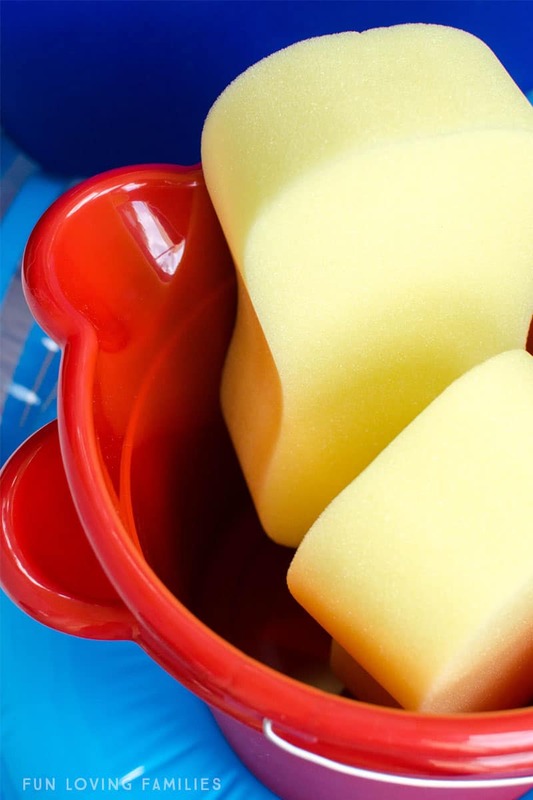 The player at the front of the line squeezes the water from the sponge into the bucket then passes the sponge back (over-head again). The player at the back then refills the sponge with water again. Play repeats until one of the teams reaches the marked line on the empty bucket. The fist team to fill the bucket to the line wins! How to play: Players use their squirt guns to try to move the cup across the string the fastest. See This Grandma is Fun for more details about this DIY pool game. How to play: Players can take turns trying to knock over as many “pins” as possible. 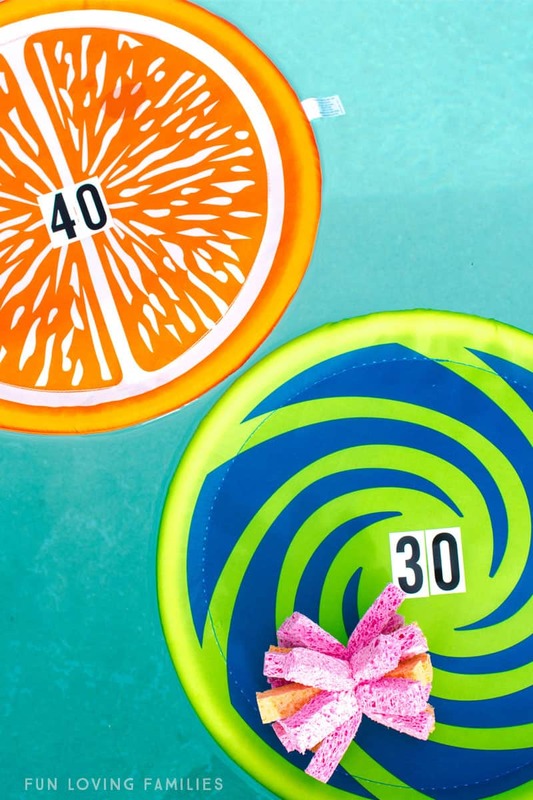 See The Polka Dot Chair for more details on this DIY pool party game. How to play: Soak the sponge ball in water then give it to whoever is “it” (i.e. the tagger). The rest of the players run around and try to avoid getting hit with the sponge ball. If a person is hit with the sponge, that person is now “it” and play continues. 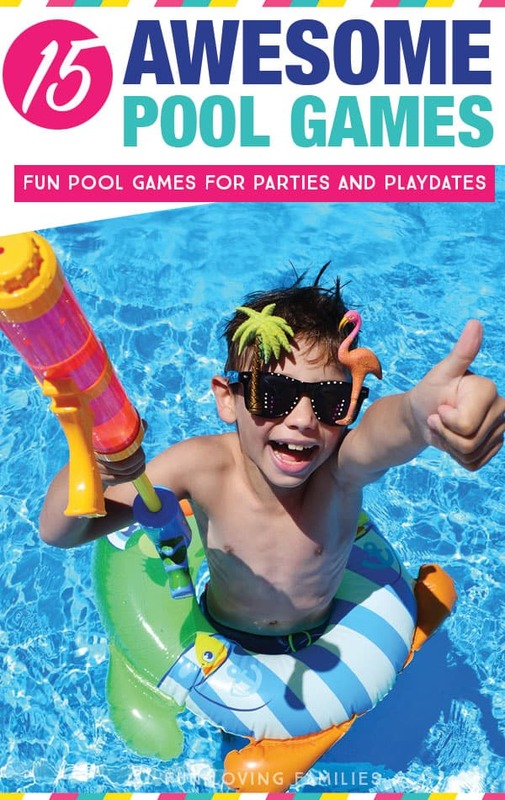 This is a great game to play at a pool party since the kids are already in their bathing suits and ready to get wet! If you liked this post, please share it with your friends and Pin on Pinterest!